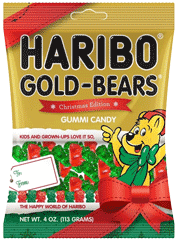 Red and Green Christmas bears, 113 gram / 4 ounces. Note: Order at your own risk in the summer months. We do not package to withstand heat during shipping.